Anajosé Aldrete (b. Mexico City, 1978). At the age of 18 she moved to London where she studied at the Method Studio and at the École Philipe Gaulier. She then did a two year diploma on stage management and theatre production at the Royal Academy of Dramatic Arts. At the end of her studies in London she enrolled at the Eugene Lang College which is part of the New School University in New York, where she obtained a Bachelor in Arts and graduated in 2006. In 2007 back in Mexico City she participates as an actress in the play Historia de Animales written and directed by Edurne Goded. That same year she was awarded the FONCA grant and takes part in two feature films Se le Hizo Fácil directed by Pedro Gonzales and Voy a Explotar by Gerardo Naranjo. In 2008 she collaborated with Daniel Goldaracena and Punto Pig in the international faire of contemporary arts (FIAC) in Leon Guanajuato, with Ake Parmerud at Instrumenta Contemporaneo in Oaxaca, and with visual artist Adriana Lara in a performance piece at Art Basel Miami. 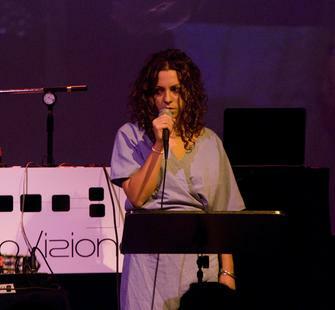 Currently she is part of Ablación, an interdisciplinary project with sound artist Rogelio Sosa , and the experimental rock band El Resplandor with visual artists Esteban Aldrete and Pía Camil.